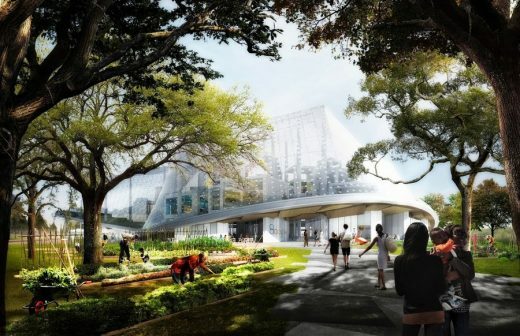 Heatherwick Studio and BIG have released new renderings of the campus. 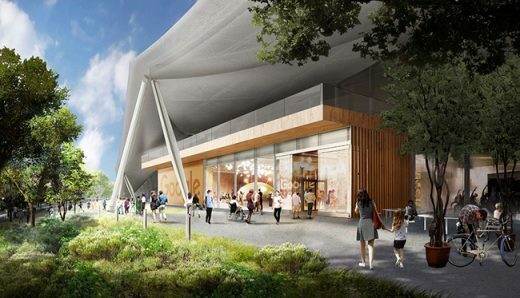 Key elements include a sprawling tent-like roof that will enclose several discrete structures, regulating the internal climate. 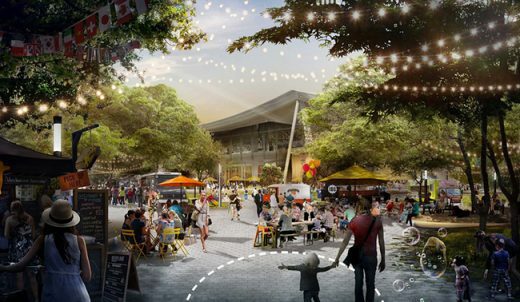 A green loop lined with cafes and shops will thread through several of these pavilion structures. 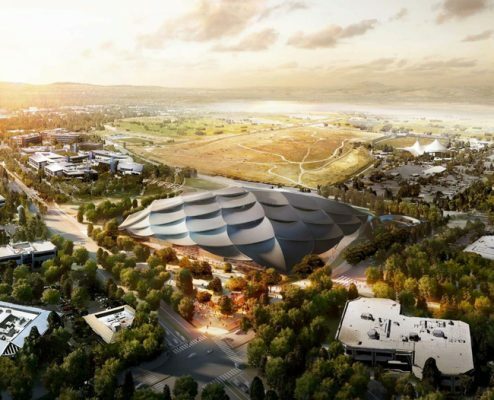 This is one of three major Silicon Valley buildings for household name tech companies: Facebook have a new building design by Frank Gehry, and Apple’s donut-shaped HQ by Foster + Partners is nearing completion. 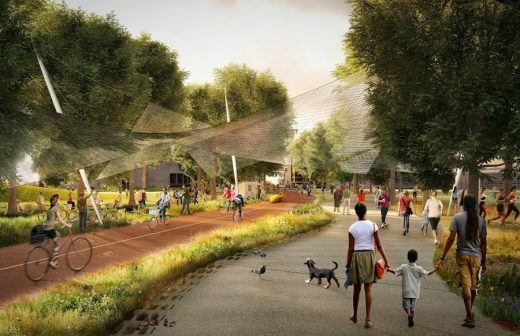 “Heatherwick Studio is thrilled to be working on this exciting project for Google and the community of Mountainview, California. 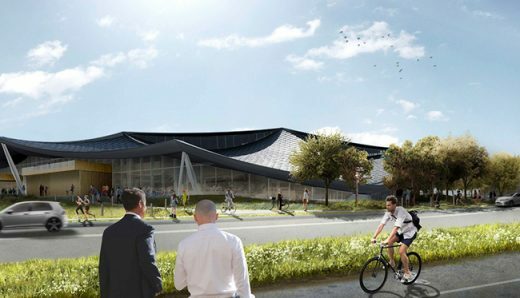 This is an opportunity to not only create a new home for the world’s most innovative company, but also to make a vibrant piece of town at the same time as protecting and enhancing the local natural habitat. 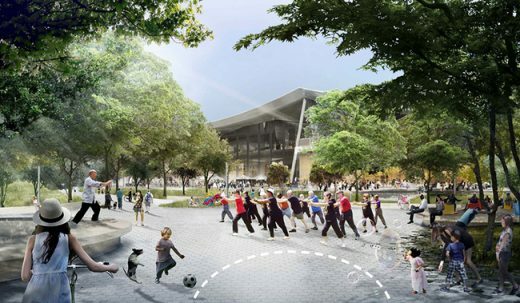 “Today we’re submitting a plan to redevelop four sites—places where we already have offices but hope to significantly increase our square footage—to the Mountain View City Council. 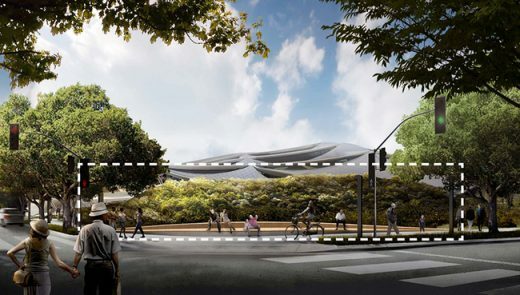 It’s the first time we’ll design and build offices from scratch and we hope these plans by Bjarke Ingels at BIG and Thomas Heatherwick at Heatherwick Studio will lead to a better way of working. 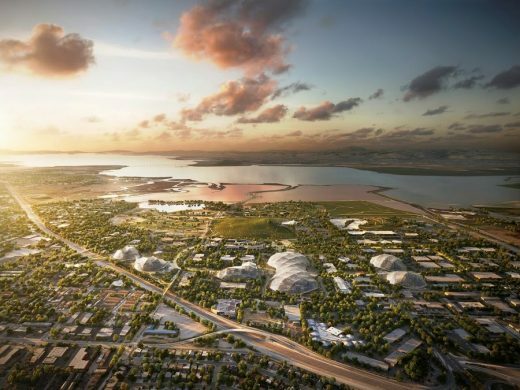 Published on 27 Feb 2015 – Vice President of Real Estate Dave Radcliffe and architects Thomas Heatherwick and Bjarke Ingels discuss our proposed Master Plan for our new campus in Mountain View, California. With our proposal, our focus is on creating space for people, nature and ideas to thrive. The idea is simple. Instead of constructing immoveable concrete buildings, we’ll create lightweight block-like structures which can be moved around easily as we invest in new product areas. (Our self-driving car team, for example, has very different needs when it comes to office space from our Search engineers.) 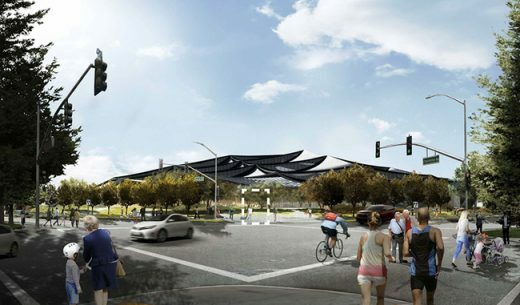 Large translucent canopies will cover each site, controlling the climate inside yet letting in light and air. With trees, landscaping, cafes, and bike paths weaving through these structures, we aim to blur the distinction between our buildings and nature. Of course, this project is about much more than just office space; it’s about doing more with the local community as well. So we’re adding lots of bike paths and retail opportunities, like restaurants, for local businesses. 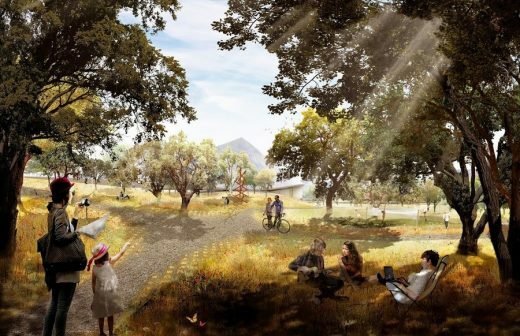 We also hope to bring new life to the unique local environment, from enhancing burrowing owl habitats to widening creek beds. And we’re committed to do everything we can to save energy—our recent agreement to offset our energy consumption in North Bayshore with renewable energy includes the development of this proposal. 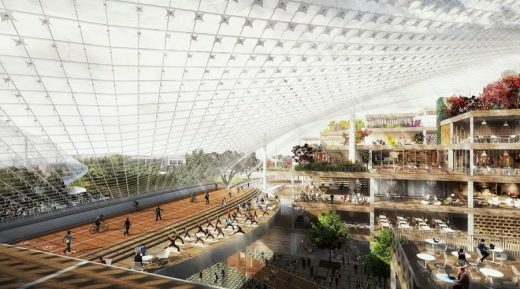 Google occupies some of the most famous offices in the world but not one of the places in which the company’s 35,000+ employees work has been built by the company. The core of the “Googleplex,” as the headquarters in Mountain View, California, is generally known, consists of a suburban office park once occupied by Silicon Graphics that Google remodeled to suit its needs; in New York, Google occupies and owns the enormous former Port Authority headquarters in Chelsea. The company’s home base in Mountain View has expanded to roughly 65 buildings. 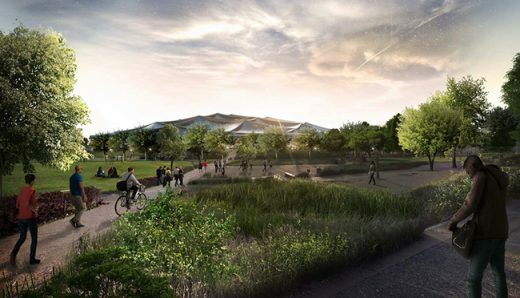 For the last year or two, Google has been looking at designing a major new building. In 2011 it went so far as to hire the German architect Christophe Ingenhoven (Ingenhoven Overdiek Kahlen Partner) to design a brand new, super-green structure on a site next to the Googleplex, but that was a false start: the company abandoned the project a year later, when it decided to build in another part of Mountain View, closer to San Francisco Bay, and went looking for another architect. 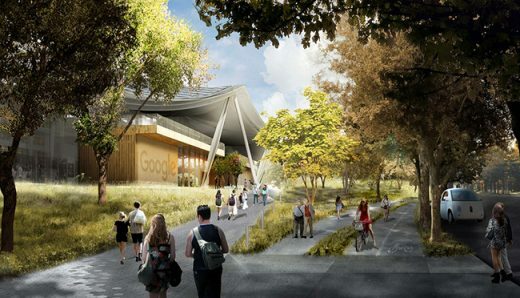 Now Google has partnered with the Seattle-based firm NBBJ. The new campus is called Bay View and consists of nine roughly similar structures, most of which will be four stories high. 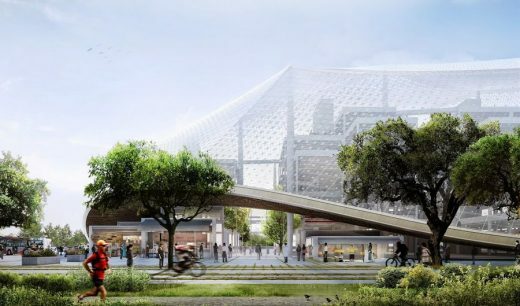 The buildings are designed to maximize “casual collisions of the work force.” No employee in the 1.1-million-square-foot complex will be more than a two-and-a-half-minute walk from any other. The building have a mix of private, quiet work spaces – no private offices – and social and communal work spaces, including cafés.